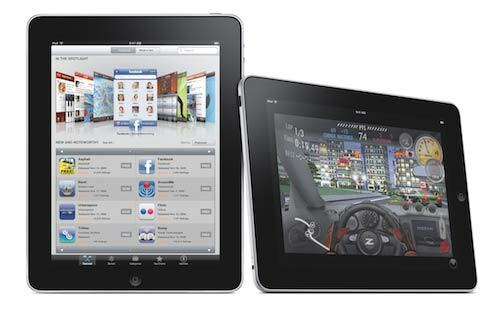 The rumored Apple tablet (iPad 1) is now reality -- or will be in 60 days. Is it a netbook game changer? Is it a Kindle killer? Is it the love child from the marriage between the iPhone and Macbook Air? What exactly is it and who should buy one? The essence of the iPad is its 9.7-inch LED-backlit IPS display -- a touch screen not only with 8 times the "real estate" of the iPhone 3GS screen, but with many more Multi-Touch sensors (over 1000). When the software engineers started re-engineering the iPhone apps to take full advantage of the iPad's screen, they got very excited. They were inspired to "re-imagine, redesign, and rebuild" the user interface of key apps (such as iWork, Mail, Calendar, Address Book). If the iPhone provides a taste of Multi-Touch, the iPad provides a gourmet buffet. When Apple invited third parties to try their hand at iPad native apps, those parties were equally amazed. My favorite example is the game developers. With the iPad version of N.O.V.A., Gameloft was able to add new, more flexible touch screen controls (like turning dials and multiple target selection) that greatly enhance the player's experience. As the EA guys point out, holding a light, HD display inches from your face, you experience the full field of view and the sensation of speed when you are racing with the iPad version of NFS: Shift. In fact, I would say, having played games on the iPhone as well as all the newest gaming consoles, that the iPad will change the way games are designed and played because it allows you to interact with the game world in ways not possible on any other platform. And if the OpenGL 3D graphics hardware can deliver strong performance, we will witness a stampede to the iPad by many hard-core gamers. The drama isn't just with games. After seeing the demos of the Keynote, Pages, Numbers, and Brushes, I believe Apple has achieved their mission: to create a new category of mobile device that does things that no other mobile device can do in ways that no other mobile device can do it. That's the definition of a paradigm shift. At first I was upset over the 60 to 90 day delay on shipping. But by releasing the software developer kit (SDK) this week along with the simulator that runs iPad apps on your Mac, we consumers can look forward to many native iPad apps being available when our iPads ship. And when the skeptics see what we early adopters are doing with the iPad, there will surely be a second wave of adopters. On a practical level, the larger screen makes mobile touch-screen surfing with Safari much more pleasant than using the iPhone, eliminating the constant need for zooming and scrolling of web pages. And with a screen sized similarly to a typical page of a book, it makes eBook reading more "natural." For the record, the pixel resolution per inch drops from 163 to 132 compared to the iPod Touch and iPhone 3GS. (Compare both to the 252 ppi of the Nexus One.) And though the iPod Touch/iPhone applications you bought from the iTunes store will run on the iPad, the pixels double in size if you have the app fill the bigger screen, causing the graphics to suffer in quality. You'll want to buy your favorite apps in the native iPad version. You can sketch on it using iPad apps like Brushes, but I find my self craving a pressure pen (a la Wacom). As an amateur cartoonist, I love to doodle, but not with my finger. The iPhone and iPod Touch have drawing apps but they are frustratingly useless. When I want to do serious sketching on a Mac, I reach for the Bamboo on my MacBook Pro or Intuos drawing pad on my Core i7 iMac. I hope Apple will seize the opportunity to make the iPad into a real sketch pad. The CPU is a new, custom chip from Apple they call the "A4." According to AppleInsider, it includes the Cortex-A9 MPCore (identical to the processor in the nVidia Tegra and Qualcomm Snapdragon), a ARM Mali 50-series GPU, and a memory controller all on one die. The 1GHz core clock runs almost twice as fast as the iPhone 3GS (based on Cortex-A8) and equal in clock speed to the Google Nexus One (which uses the Qualcomm Snapdragon). It's not clear if the iPad has two or four cores called for in the Cortex-A9 reference design. It's got a virtual keyboard that's larger than the iPhone's thanks to the larger screen. It remains to be seen if you can easily touch type. You can order the optional Keyboard Dock which, among other things, allows you to connect a real keyboard. I understand there is support for Bluetooth keyboards which might be an even better option. Wireless networking features 802.11n, which is available on the MacBook Air but not on the iPhone 3GS (802.11g). The version with 3G will have a top download speed of 7.2Mbps, but you'll only be able to get that speed if AT&T upgrades their 3G network. (Currently, the best I've clocked is 1.6Mbps download and 384Kbps upload.) While you are waiting for AT&T's wireless broadband upgrades, if you have the Sprint 4G network in your community, you may want to pick up the Overdrive 4G palm-sized mobile hotspot as an iPad "accessory." The built-in flash drive ranges in capacity from 16G to 64G. That matches what's available on the iPod Touch (up to 64G) but beats what you can get on the iPhone 3GS (32G max). It's half what you can get on the MacBook Air (up to 128G SSD + 2GB of RAM). I wonder if you can use the SD card reader for backup storage. Its battery is long lasting. It gives you up to 10 hours of web surfing via WiFi and video watching. That's similar to the number of hours the iPhone 3GS offers and twice what the MacBook Air offers for those activities. It's light. Weighs 1.5lbs. That's lighter than a MacBook Air by half, but 6 times heavier than an iPod Touch and 5 times heavier than an iPhone. It's thin (.5"). It's thinner than a closed MacBook Air but thicker than an open MacBook Air. And it's slightly thicker than an iPod Touch or iPhone. Like the iPhone 3GS, you'll be able to use Bluetooth headphones. Lastly, it is affordable. At the starting price of $499, it's an easy purchase to justify even if you're not sure how you plan to use it. WHAT'S MISSING from the iPad (version 1)? 1. An iSight camera for iChat sessions, video capture, and still photos. I would even call it a glaring omission. 2. Handwriting recognition software. The iPhone 3GS has voice recognition apps already. I'm told that handwriting recognition is easier to engineer than voice recognition. If Apple's memories of Newton discourages them, maybe a third party will have the courage to offer handwriting recognition. 3. Support for 4G wireless broadband. I know that AT&T doesn't support it currently but LTE is coming to AT&T (and Verizon) as early as Fall 2010. How are you going to feel if Apple releases a 4G version 6 months after you buy the iPad? WHO WANTS AN iPad? LETS SEE A SHOW OF HANDS. Students who don't want to lug around a 5lb laptop in their backpack will find the 1.5lb iPad a tempting option -- especially at $499 (or half the cost of the cheapest Apple MacBook). Artists might find it useful for presenting an electronic portfolio as well as an electronic sketch book. Mad scientists, like me, can use the iPad and a copy of iWork's Numbers as an electronic clipboard during lab testing. Business persons might find it useful to take to boardroom meetings. And a third party projector, like the one you can get for the iPhone, could be used to give Keynote presentations. Movie buffs will find movies much more enjoyable to watch than on the iPod Touch or iPhone. And on long airline flights, the battery life will be an advantage over any model of Apple laptop. I've already asserted that gamers will go crazy over it. MacHeads who buy anything Apple makes will want an iPad in their "collection." See Jony Ive, Scott Forstall, and Bob Mansfield talk about the design and engineering of the iPad 1.